Cricket Hill was a wonderful place to get married! It is absolutely beautiful, and April was wonderful to work with. There are so many options available at this venue, and it is just gorgeous! I cannot picture getting married any where else. Excited for my wedding on March 29th this is the venue of Texas!!! My daughter was married in Nov 2018. The venue is absolutely beautiful since it is in the Texas Hill Country. It is flexible venue for either an indoor or outdoor wedding or a small, intimate wedding or a large. It is the perfect blend of elegant and rustic. From the first time we met April, she was welcoming and knowledgeable. We knew right away that this was where we wanted to hold my daughter's wedding. The bride and grooms suites were the perfect places for everyone to get ready. The wedding was held outside under the trees and twinkling lights. The sun was starting to set and just a picture perfect scene. We had a formal sit down dinner in the main house. The reception was held in the "barn" which was perfect for dancing and pictures. There were plenty of areas outside for guests to mingle including a fire pit. April and Aubrey were always available and answered our many, many questions. With all the details that go into a wedding, Aubrey worked closely with my daughter and tried to keep us from feeling overwhelmed. Cricket Hill Ranch made my daughter's wedding day memorable. Cricket Hill Ranch is a beautiful and amazing venue. I loved that it had different options for the ceremony and reception sites. Not to mention the amazing Bridal and Groom suites! April, Tom, and Aubrey were very helpful from the day we booked all the way to the day of. My only recommendation would be to use outside bartenders. We did not have the best experience with one of the bartenders provided; some of the behavior was actually quite embarrassing to the guests who witnessed it. The issue did get handled and that was appreciated. Would highly recommend! More than we could have imagined! Cricket Hill is perfection! April and Todd are amazing and have become forever friends of ours! They were on premises the entire time, working hard to make everything PERFECT! There’s no way we could have chosen a better venue or couple to work with! 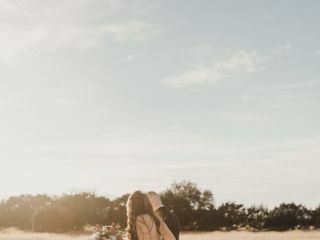 If you’re looking for a GORGEOUS Hill Country wedding venue, don’t look any further. Cricket Hill is the whole package and you won’t find a better value!! April and Todd were amazing to work with for our wedding. This venue is remarkable and the hosts are the same!! CHR was amazing from the beginning; we looked at CHR first and the venues we looked at afterwards were a sad comparison AND more expensive! My husband said the other venues were just going to nickel and dime us to death; which was true. Everything was 'you can do this for a fee' or 'we'll charge you for that.' Not at CHR! What you see is what you get! April and Aubrey are a great team; Aubrey answered all my ridiculous questions and April is so accommodating. Our wedding was beautiful and our guests commented on how much fun they had, how beautiful the venue was, etc. Aubrey's nature to swoop in and fix a problem is such a great quality in a wedding planner. When I chose to go with a random hair/makeup person and that lady started acting shady about money, Aubrey took care of the problem in one phone call. (Huge help for someone who avoids confrontations.) Aubrey also saved the day during the wedding, when me 2 year old niece/flower girl decided to sit down before she got to the aisle and almost had a melt down. Aubrey grabbed her and walked down the aisle with her. It was perfect and so cute too! Get married at CHR, nothing else compares! Thank you Ashley, we LOVED working with y’all. Your dads speach in the deck brought tears to my eyes. Thank you for letting us share in such a special event. You’re The Best. Come see us. Great venue, great people working there! You get so much and at a great price. They include a wedding coordinator! Without that we do not know what we would have done! Ps: that photo is Amazing! I have nothing but positive and wonderful things to say about Cricket Hill Ranch. The venue was our favorite in pictures, but we went to see some other venues before this one and had planned to see some after visiting this one. The moment we pulled up to CHR we knew it was the one. The house is absolutely beautiful, the barn is so much fun and gives the rustic feel, and the lawn is breathtaking. April, Todd, and Aubrey go above and beyond to make sure your big day is perfect. We had so many guests come up to us during the reception raving about how beautiful everything was. Naturally, not everything goes perfectly or you forget something on your big day, and for us it was rain. We ended up doing our ceremony in the great house because the ground was so wet, but we weren't even upset because the great house is so incredible and the team worked really hard to make sure everything still went seamlessly! I honestly can't say enough about Cricket Hill Ranch. They made our wedding day absolutely perfect from start to finish. April was incredible to work with and it is clear that they take a lot of pride in their property. All of our guests raved about how beautiful it was. Since we got married in November it was important for us to have the flexibility to do an inside our outside venue since the weather can be a little unpredictable. Cricket Hill gave us several options for where we could do both the ceremony and reception. We ended up being able to have it outside at sunset. The string twinkle lights under the big tree made everything look magical. 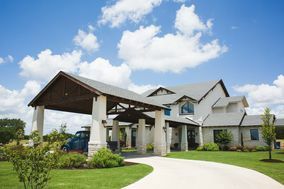 Cricket Hill Ranch is a beautiful venue with both indoor and outdoor options! If you're looking for a place with scenic country views (think rustic and it's perfect for pictures) to tie your nuptials, this is the place. Dripping Springs and the surrounding areas have plenty of vendors that can help make your day perfect. Aubrey and April are awesome, too. They will listen to and help you with every need you have and on top of that, they know exactly what they're doing and don't miss a beat. They take the stress off of planning the big day, which is exactly what we were looking for. I highly recommend this venue for your wedding and we're so, so happy with our choice. Couldn't have picked a better place and we got some many compliments on the choice! This place was amazing! April and Aubrey work so well together and were so helpful to us the entire time. The property was so gorgeous and they were so knowledgeable and respectful. They went above and beyond to make our day beyond amazing. We had a wonderful experience here, and are so grateful for their help and our time here!!! 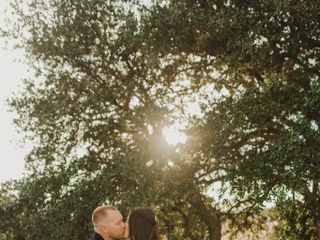 The best decision I made during the wedding planning process was choosing Cricket Hill Ranch for my venue. I looked at over 10 venues and none made me feel that spark of magic I was looking for. From the first second I saw Cricket Hill Ranch in person, I knew this would be my venue. When we first met April, the owner of the venue, she made us feel SO welcomed. She clearly is in this business because she wants her brides to have the most special day possible, and when the day of came around, she made sure my day was exactly what I wanted it to be. There are SO many beautiful areas in this venue that it will match the style and visions of ANY bride. 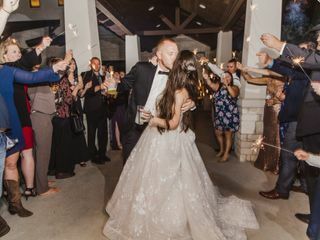 The inside grand room is amazing, the lawn where our ceremony took place was perfect as it is surrounded with the most beautiful natural landscaping, and the barn is the best location for an epic reception/dance party. My guests continue to rave about how beautiful this venue was. It is elegant in architecture, plush with green surroundings, and still has a rustic feel to it with the barn and wooden deck. This venue was exactly I was looking for visually, but the best thing about it is, you're not just getting the most beautiful venue in the area, you're also getting a venue owner and a day of coordinator, Aubrey, who will make sure your day is EVERYTHING you've dreamed it to be. I was a bridesmaid in a wedding the first week of June which took place at Cricket Hill Ranch. I don't have enough great things to say about this venue. The girls suite was incredible. We had an open area to lounge, personal mirrors and plenty of space, plus a giant bathroom and closet (what more could a girl ask for?!). My favorite part of the girl's suite was the balcony that overlooked the entire outdoor venue. It was beautiful. The day of the wedding, we encountered rain about 2 hours into the reception. Cricket Hill Ranch quickly had Plan B in place and was able to accommodate all guests either dancing in the barn, enjoying cocktails under the balcony/overhang, or relaxing indoors. The transition was so smooth that the party didn't have to stop. 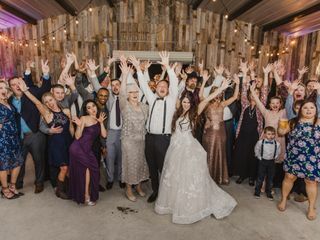 The distance between the dance floor in the barn and the outdoor overhang bar area were not far at all, which made for quick dance breaks, then right back to it! The owner of the venue was awesome. She clearly knew what she was doing and was able to accommodate all of our amazing bride's requests. The venue is beautiful, inside and outside. I don't have a bad thing to say about this venue and would recommend it to anyone looking for a fun, photo-worthy, Austin wedding! I got married at Cricket Hill Ranch in May, and it was everything I ever dreamed of for my wedding venue and more! I had a lot of guests from outside of Texas, so I wanted to give them an authentic Texas Hill Country experience while still reflecting my modern tastes. 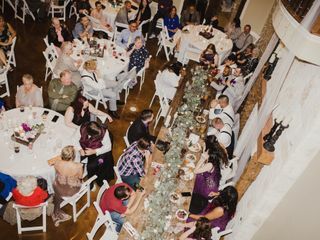 I chose to have both my ceremony and dinner in the beautiful Great Room to avoid the Texas heat, which was a decision both my guests and I appreciated! Dancing was in the barn, and there was a nice breeze flowing through the doors that kept the space cool. The reason I first fell in love with this venue is that it feels like a home rather than an “event space.” The on-site bride and groom’s suites were so convenient and comfortable, and my guests enjoyed having so many options to explore between the great room, the upstairs and downstairs patios, the lawn, and the barn. I love this venue so much, I chose to hold my rehearsal dinner and a post-wedding Sunday brunch there as well! April was so incredibly kind and helpful both before the wedding (which was a long period of time - I booked way back in December 2015!) as well as at all three of my events. She truly cares about the people she hosts, and goes above and beyond to make sure your event is exactly the way you want it. I encourage anyone looking for a venue to visit Cricket Hill Ranch - I guarantee you will fall in love with it too! If i could give this place more than 5 stars, I absolutely would! 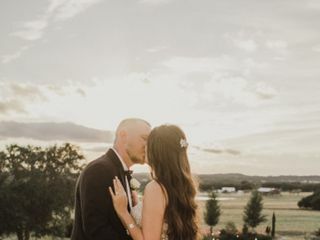 My husband and I just got married at Cricket Hill Ranch a week ago and I can honestly say it was one of the best decisions we made. The setting is absolutely beautiful and April & her husband are two amazing people that do so much to make sure the day is perfect! We got sooooooooo many compliments from our wedding guests on the beautiful venue so do yourself a favor and BOOK THIS PLACE NOW! You will not regret it!!! We recently had our wedding at Cricket Hill Ranch. The whole thing was more beautiful than I could have ever imagined. April was very easy to keep in touch with and let us come by several times to see the venue when family members were in town to check it out before hand. April has great taste and it is reflected in the style of all the little details. I loved that there were different areas for people to hang out. We got the bartender from April too and he was fantastic. Overall I couldn't have been more thrilled with how the day came together. Made my wedding the most memorable and beautiful ever! My first meeting with April told me it would not be my last. She is knowledgeable and helpful without being overbearing. She makes sure you have what you need while suggesting ideas and vendors as needed. She was just as excited about my wedding as she was about her very own (which was just a few years ago at the same venue). All of my excitement was her excitement, and that showed in the way she treated my family and I. This wasn't just a business transaction for a wedding venue; April and Todd opened up their hearts and their homes to us. Upon our arrival for each meeting and the wedding day, April was always out front and ready to go with whatever our plans for the day held. On the day of the wedding, April and her husband, Todd, were helping with setup, making sure things were perfect. She would come by and check on us briefly, only to get back to work! She is very transparent about how she does things, and she is always willing to try things in a new or different way. My only complaint was that we were all so busy, I didn't get to see her much on wedding day! From one groom to the next: "It was awesome!" There is not a single thing I would want to change about this venue or the owners. Everything was perfect, right down to the last sparkler fizzling out! I cannot even begin to explain how great April and Todd (the owners) were in the process of planning and executing our wedding day. The venue is absolutely breathtaking and was perfect for our small(ish) wedding. April was easy to contact and ask questions, and very quick to respond and help. They really made the whole planning process much easier and more enjoyable. It's an extremely versatile location and can accommodate a variety of styles, from rustic to elegant. All of our out of state guests were amazed at how beautiful everything was there. It was a very intimate experience and I'm so glad we chose them. Cricket Hill Ranch is an amazing spread in the Hill Country just west of Dripping Springs. From the moment we first visited, we knew this was where we wanted to get married. And given the fact that we had a guest list of 300, it also offers the space for this large amount of guests. The main house is architecturally stunning and well-planned. The central "great room" was a perfect indoor gathering place for our first dance; the massive kitchen gave plenty of space for the caterers to prep food service; the Groom's suite with pool table, comfy sofas, and plenty of TVs was the perfect diversion from the potentially nervy last hours prior to the ceremony itself; the Bride's quarters offer a huge shower ideal for pampering herself on the day of the event, along with several vanities for bride & bridesmaids to prep hair & make-up. The house boasts an unbelievable second-story exterior balcony overlooking the grounds and sweeping hill country views--the perfect place to take in the sunset and reflect on the events of the day as the sun went down. The outdoor kitchen & bar under the covered patio is located ideally for drink service & provides enough room for bartenders. And the barn set up nicely to accommodate music and dancing long into the evening. April and her husband Todd were incredibly accommodating to us as the wedding approached, and on the day of the event. They allowed us to visit multiple times prior to make sure our plans were in place. They were laid back and allowed us to create the event in our vision, yet also were on the spot helping at every turn on the day of the event. 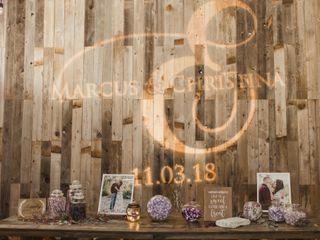 We would recommend this venue and April & Todd to any and everyone--our only regret is that we don't have a reason to go back again in the near future! We wouldn’t change a thing about the Cricket Hill Ranch or choosing CHR for our wedding day. The house, the acreage, and the people at CHR were absolutely lovely! Cricket Hill Ranch was perfect and absolutely gorgeous the day of our daughter's wedding. The staff was professional, responsive and very helpful. April and Todd are so warm and welcoming. Our guests thought Cricket Hill Ranch was awesome! The reception for the wedding of our daughter was held at Cricket Hill Ranch. She chose the site but we were the responsible party. We were very pleased with the quality of their service and professionalism. We would certainly recommend them. I would particularly like to mention Aubrey Munguia since she was the coordinator. She was very professional and on top of things. This made the occasion all the more enjoyable. We hired Verdes Catering and they also were superb. They are more expensive than other options but well worth the money.